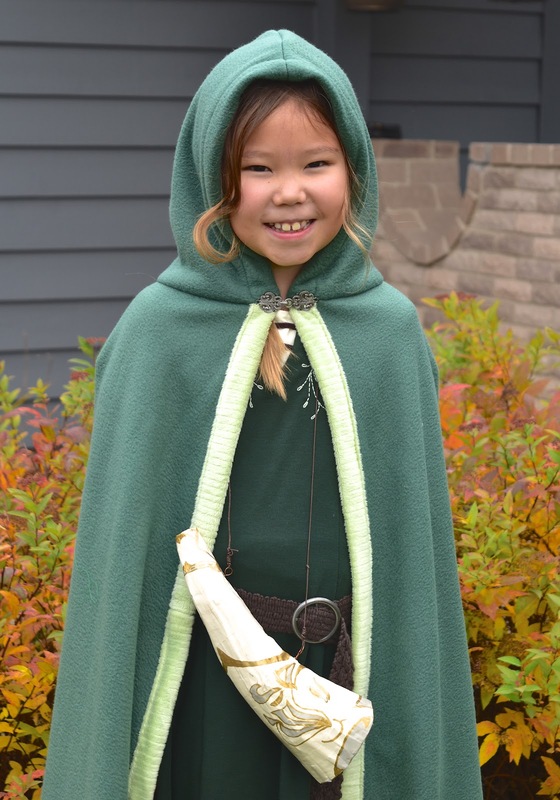 This is Jenna's third consecutive year as Susan, High Queen of Narnia. 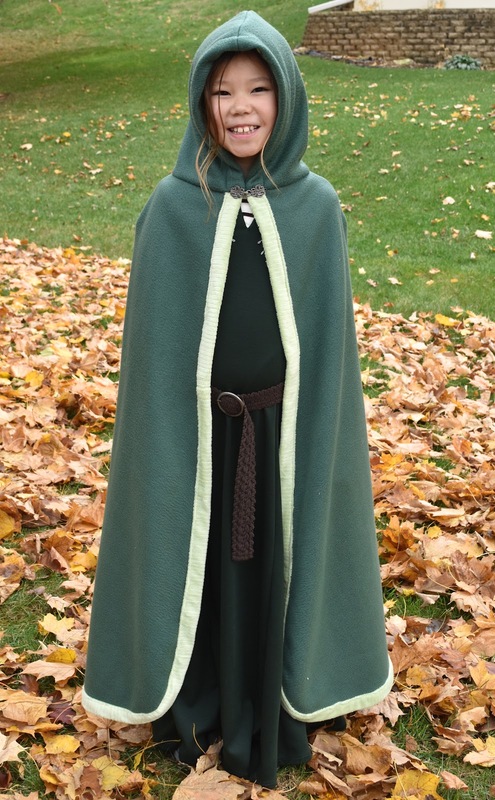 Jenna says it is her favorite of the three Susan outfits I've made her. I think it's mine, too. First, the fabric. 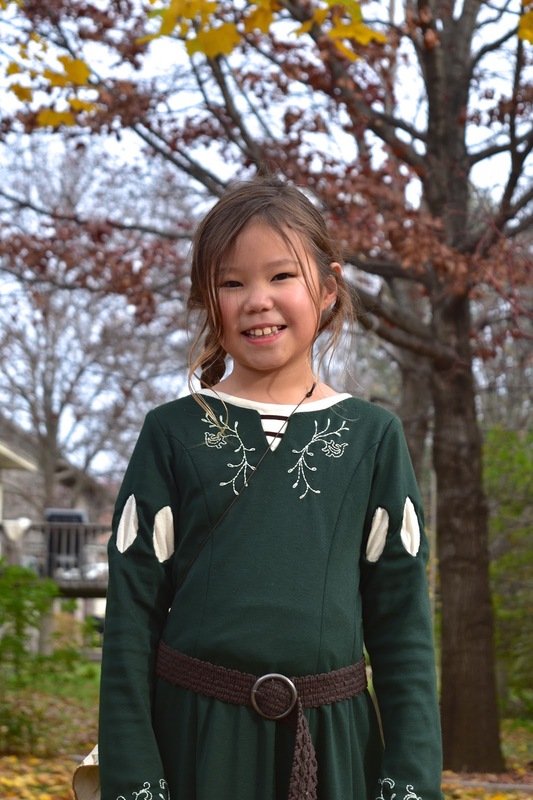 Unless it is absolutely necessary (like, for authenticity purposes), I will make my children's outfits entirely in knit fabrics. 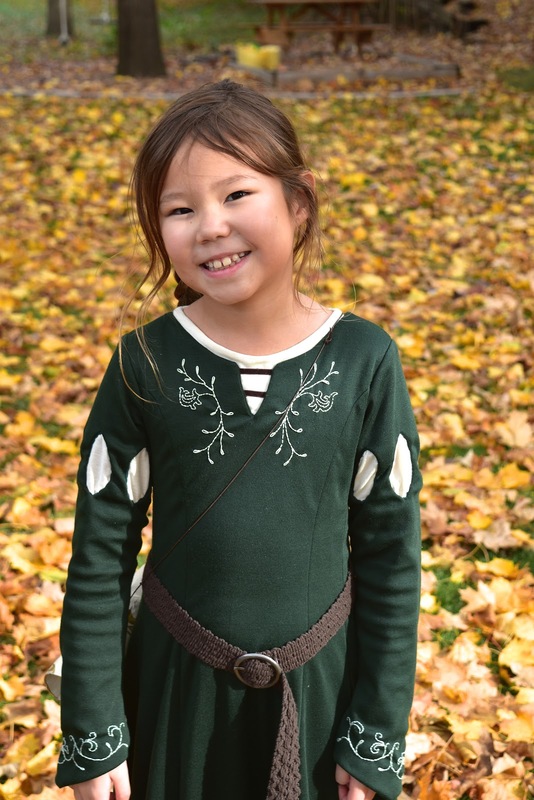 Many reasons: knit drapes beautifully, has a wonderful weight, stretches to accommodate all the crazy movement that children make, and is so comfortable that it feels like a nightgown. 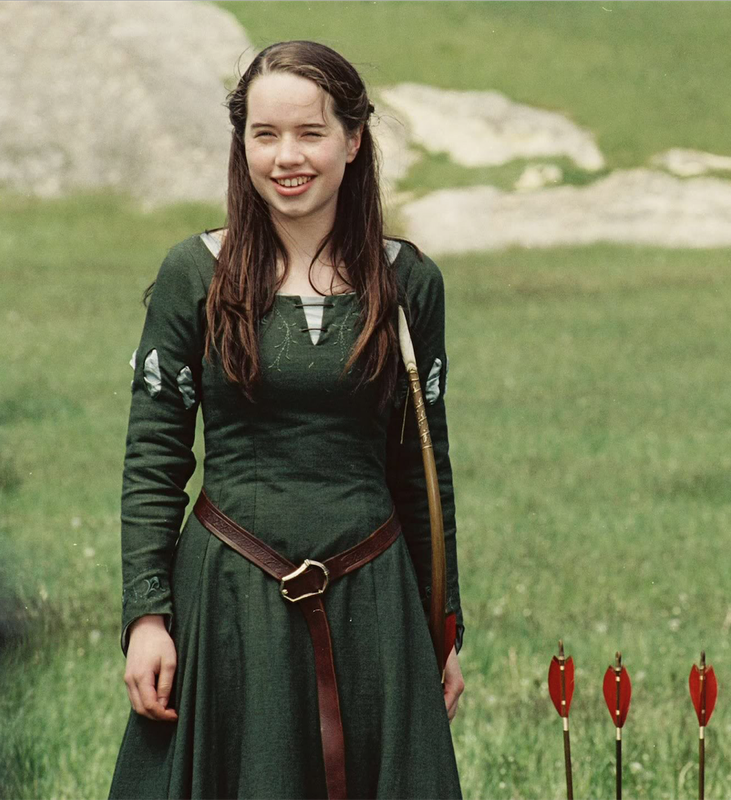 I suspect (but couldn't be bothered to research to verify) that the actual movie dress has two separate layers - the green outer dress, and the inner chemise layer, which could be either a half-body thing or a full underdress. 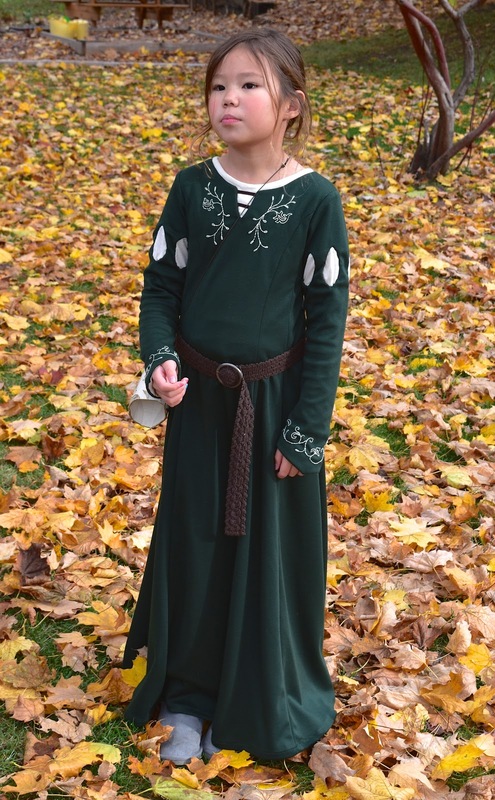 Our inner layer was just a full bodice lining hand-stitched to the facing of the green outer dress. 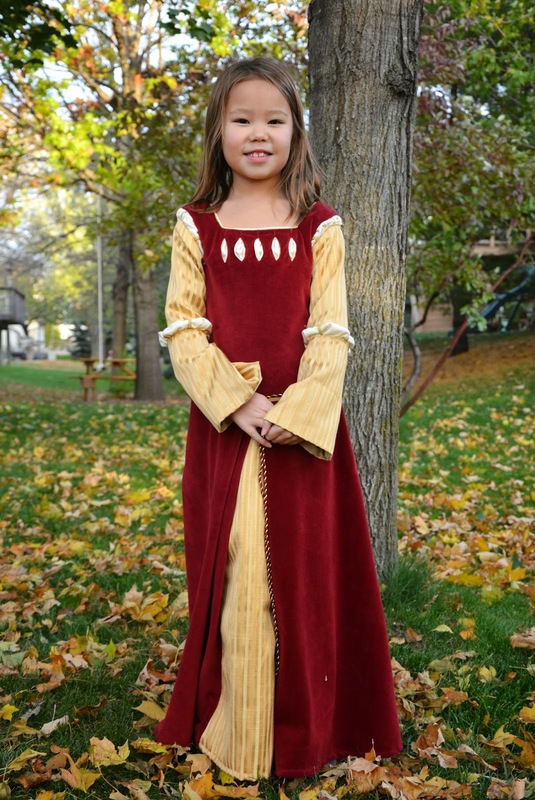 The outer dress was drafted as a full-length princess-seamed dress. 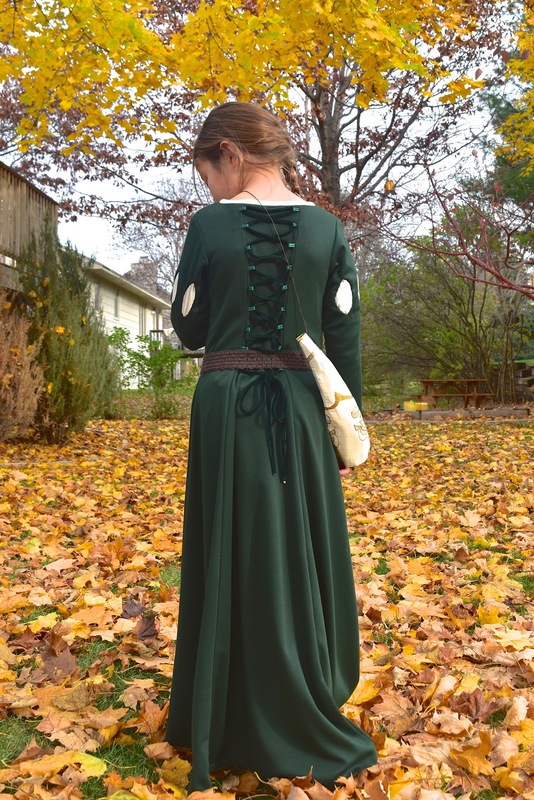 To preserve the fullness of the skirt, I drafted two princess seams (you can never have too many princess seams), both opening into the armhole, with one over the bust apex and one between that and the side seam. 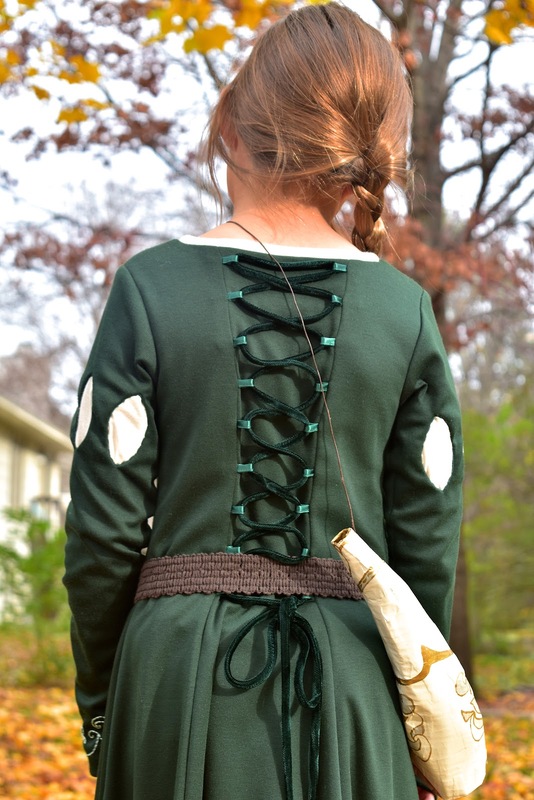 with the loops sewn directly into those back seams, and velvet cord laced through them. The dress is fitted, but the cord allows it to be further cinched if desired. Those 8 seams - 2 side, 2 back and 4 princess - are then flared from the waist to create that full skirt. Because the bodice and skirt are drafted as an entire dress (but in separate vertical panels), you are essentially working with the whole dress as you assemble the panels together. This translates to a lot of fabric under the presser foot, and it gets especially acrobatic when you add the inner chemise layers and then finally attach the sleeves. 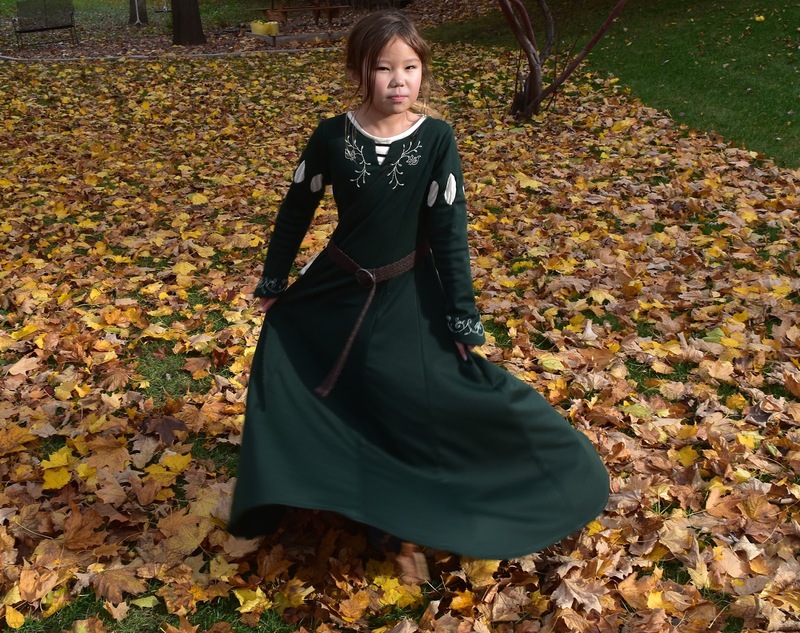 Most of the time, I construct my kids' twirly princess dresses in two parts - the drop-waisted bodice layer and the semi-circular skirt that attaches later to that drop waistline; this allows me to attach sleeves and face necklines and embellish just the top half. So this princess-seamed full dress is a departure from tht usual model. As mentioned, not difficult; one just has to be mentally prepared to wrestle with bulky bundles of fabric as one sews. When one cuts apart the full paper pattern into the individual vertical panels, one immediately loses the grainline for every piece except the ones with the straight center front (CF) and center back (CB) lines. Laying out those pieces then becomes quite the circus, unless one has had the foresight to mark the grainlines on each paper panel, and then true them against the selvedge of the fabric. All this means is one must be prepared to take a little time to get this right, to preserve the drape of each piece, particularly if the fabric is one of those unstable slippery knits; otherwise, one ends up working with accidental bias layouts and/or inconsistent amounts of give throughout the garment. Again, not the end of the world, but one has to be aware that these extra precautions come with the territory when one works with princess seams and panels. And I suspect that, were this a commercial pattern, these grainlines should be marked on each panel anyway, so all this discourse is really only for the interest of self-drafters. Okay, let's move on to the details! 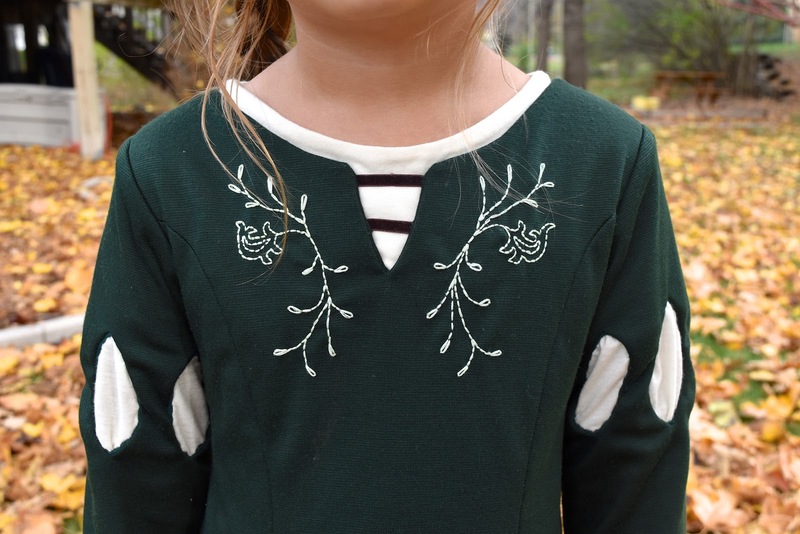 Here is the embroidery on the bodice. Simple back-stitch and random lazy daisy loops, which I leisurely stitched by hand as an after-the-kids-were-in-bed sofa activity. The cutaway windows on the sleeves were just oval welts behind which I loosely hand-stitched more swatches of the chemise fabric. The entire sleeve was lined with that chemise fabric, and I hemmed that lining layer to the outer layer. 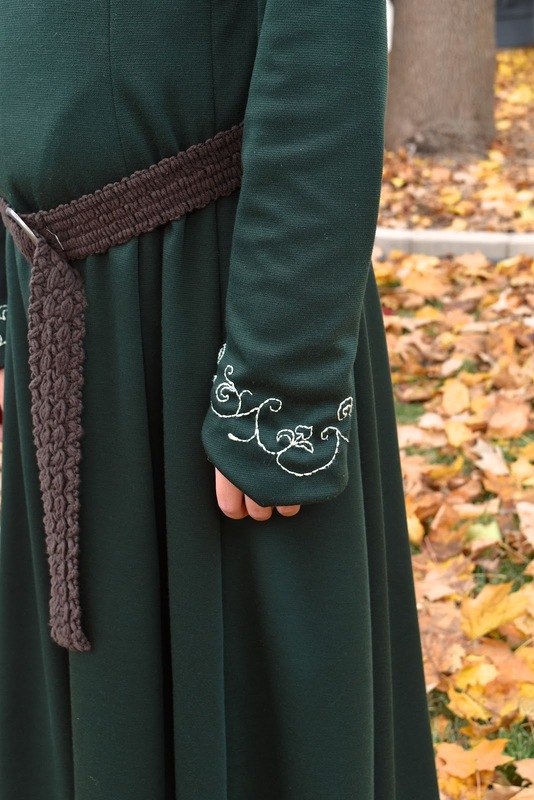 More of the same embroidery was repeated on the sleeve hem, which was tapered to a point, and slightly flared from the forearm to drape the wrist and hand. Is all this special-fit draping necessary? Well, no. But I like to be deliberate when I draft, so that I get exactly what I want. Drafting, after all, is all about transferring what's in your head (or in a photo) onto 2D paper and, from that, into 3D fabric. When I first began to draft, anything that turned out decent was a sort of coincidence or happy accident. As I practised more and learned to better visualize the paper-to-fabric process, it got much easier to draft precisely what I'd wanted to see in a garment. I thought I'd mention that to encourage anyone who's learning to draft - it isn't magic at first, friends, but it will feel like it the more you do it. And then one day, the magic will disappear because it's become so natural to turn an idea into a garment. Remember how floored you were when you installed your first zipper or made your first bag? It was a pain in the behind at first to try to get all the seams lined up and the two sides of the zipper to match, and then after a few more zippers, it was like, "Whoa! Did I do that? That was cool!" And then, two hundred zippers and four thousand tote bags later, you were all, "Yawn. I could do this in my sleep... literally. I'm falling asleep doing it." Not saying that drafting will put you to sleep, but you will get to that point when your blood pressure actually doesn't shoot through the roof each time you set out to create a garment from scratch. Hard to believe, but it's true. 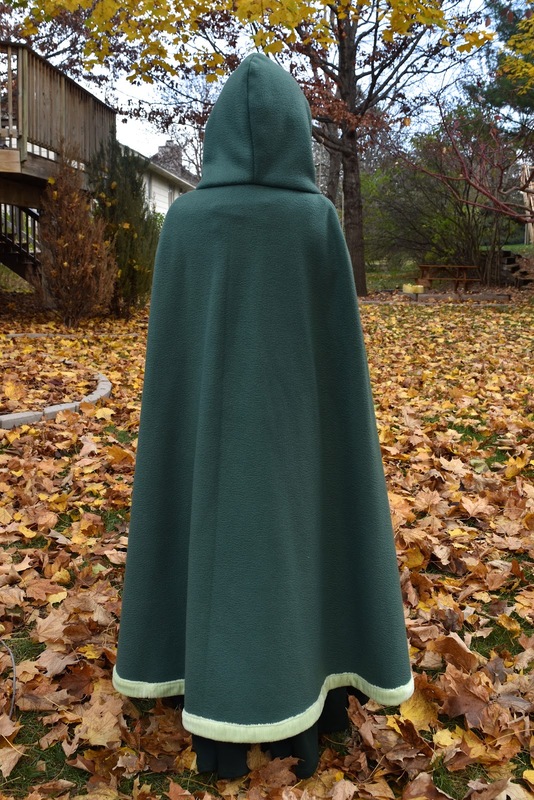 The last thing to talk about is the hooded cloak. 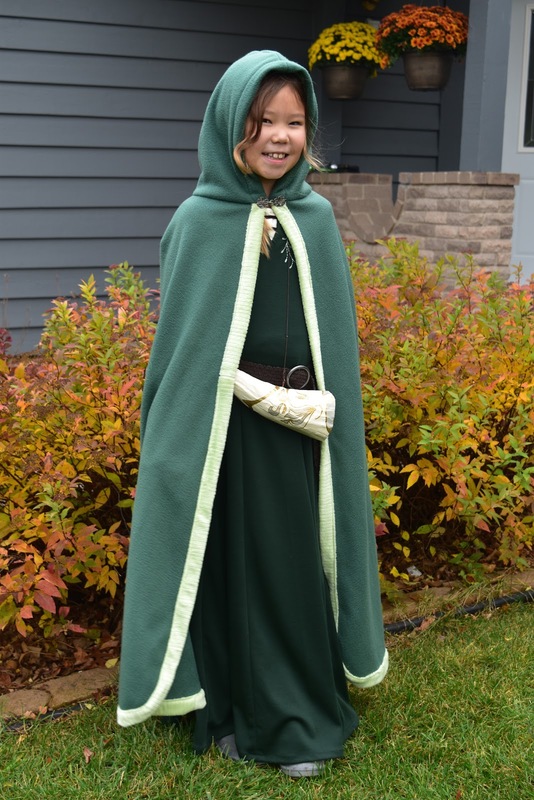 Jenna, having seen Emily's brown Jedi-esque cloak, wanted one to match her dress. Susan had one in the movies, but Jenna wanted something different. 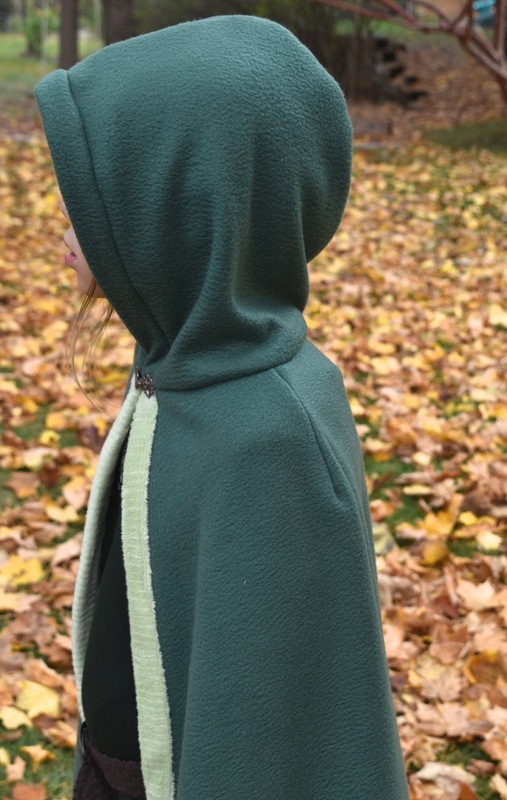 Nothing earth-shattering as far as design goes - a hood, lined with that light green fabric (although you can't see the lining), and shoulder darts to shape that area. and fastened at the neck with a clasp. 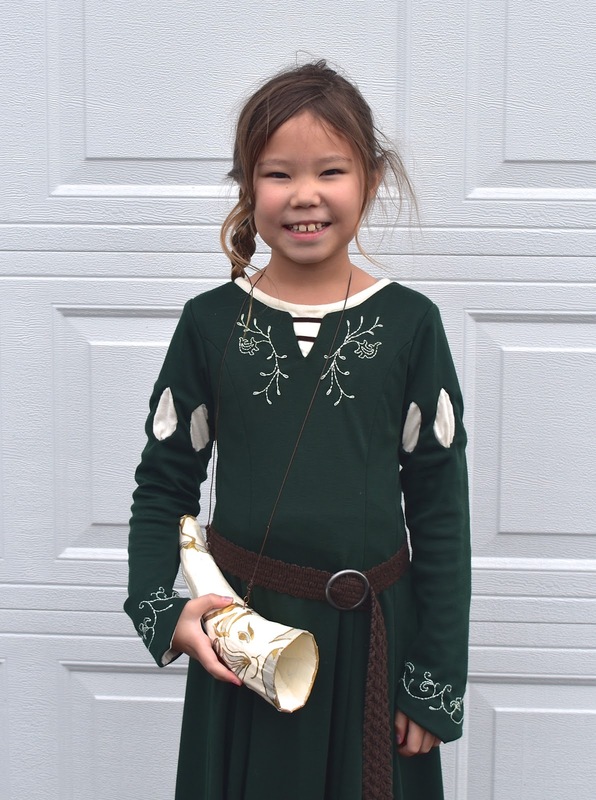 The horn is Jenna's cardboard prop from two years ago. 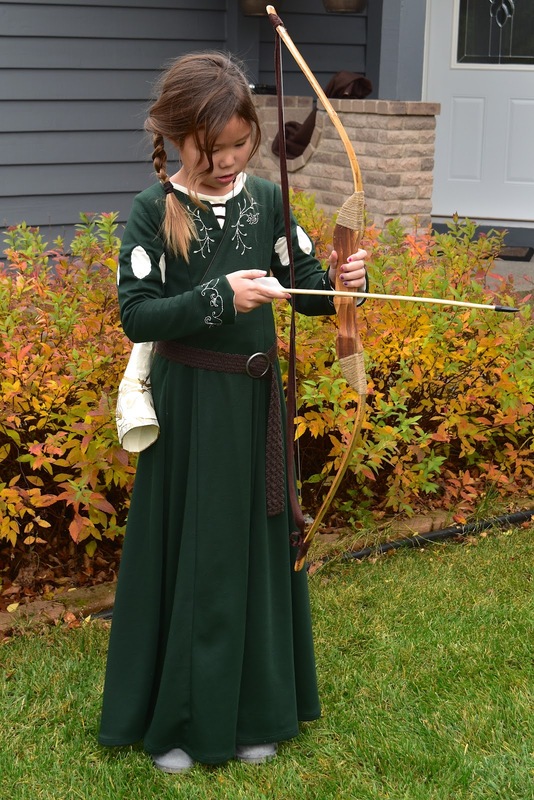 And here she is - the High Queen of Narnia, ready for war (or candy). As ever, thanks once again for sharing your process (it clicks with my brain, and my brain gets very happy to think that way) and your children. 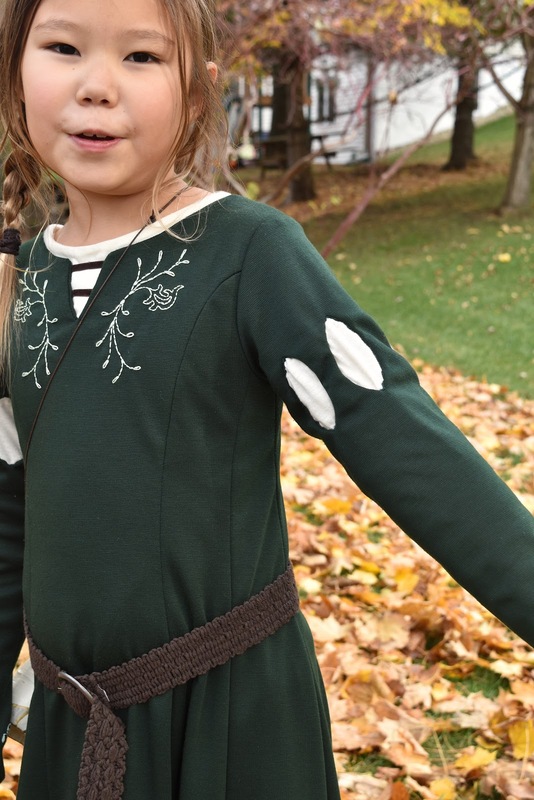 The sweetest time of a sewing parent's life, treasure it! 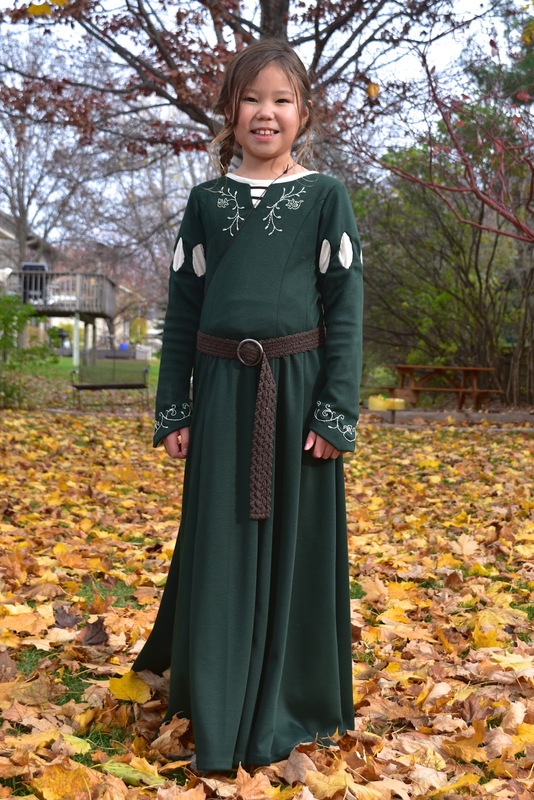 If I had to make this for an adult (and it looks like I will be this spring), I'd probably divide into bodice and skirt, cutting below the waist across the hips (reinforcement) and keeping the central bodice panel the longest one (and curved or pointed down like Princess Aurora). As long as it was all one fabric, it should keep that wonderful fit and flare effect. Gorgeous. You always get the details just right. 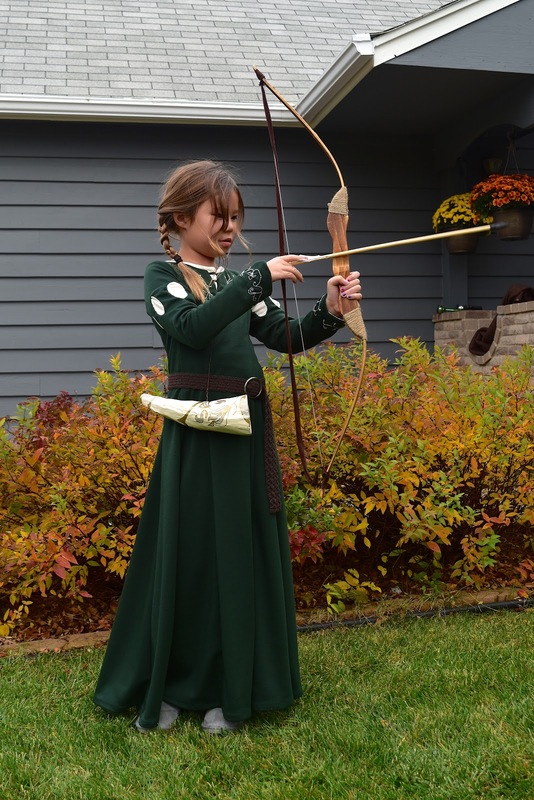 Jenna is the prettiest little queen I've ever seen, and her outfit rivals the original! Beautiful job, Mom! It's a beautiful costume. Thank you for explaining your process here. If you ever give a class on drafting (in person, I mean), I hope I can attend, I would love to learn that from you ! Lovely. I especially like the photo gallery of her costumes through the years. You can really see how much she has grown. Your girls must be over the moon with a mommy that can bring every dream to life! Again amazing Lier, beautifully done. All three and a half(carot) ;) customs . Beautiful! You can't go wrong with Narnia. 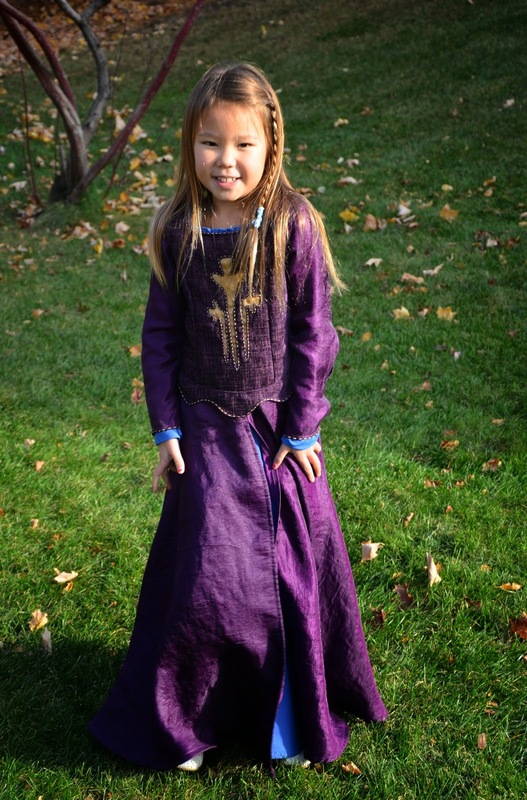 I love the construction of the dress - the princess seam front and the corseted back, as well as the embroidery. I am very impressed that her horn is still in such good shape two years later. 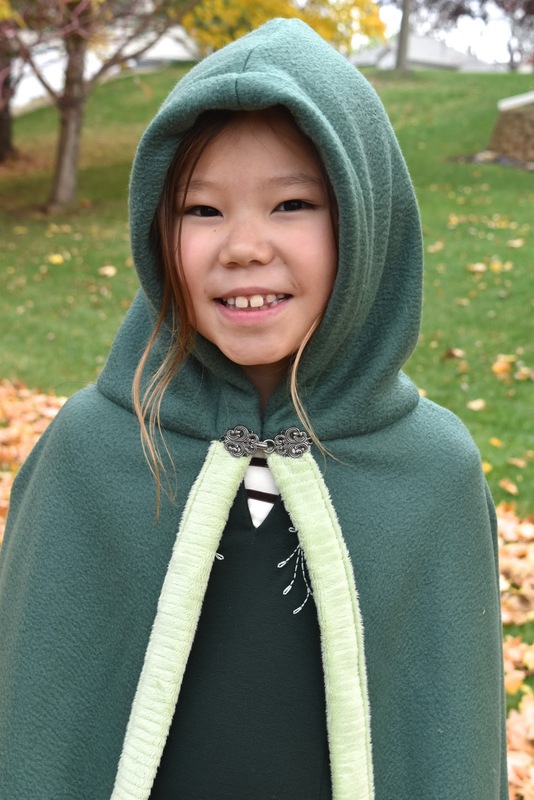 I want to try making my kids some of those capes - they would love them.